How Many People are Poor in the United States? It seems the entire world has been confused by the Census and understandable so. This past week saw dueling quotes on the number of people in poverty in the press. There are actually two major measures of poverty for 2010 and the experimental, research measure was released this week. This supplemental poverty measure shows there are more people in poverty, 49.1 million, than the official tally, 46.2 million. The official poverty rate is shown below. The current poverty thresholds do not adjust for rising levels and standards of living that have occurred since 1965. The official thresholds were approximately equal to half of median income in 1963–64. By 1992, one half median income had increased to more than 120 percent of the official threshold. The official poverty measure doesn't take into account medical costs, the costs of maintaining a job, couples who are not married, child support, geographical differences in cost of living, tax credits and government supplements to income. The official poverty threshold for a family of 4 is $22,113. The supplemental measure takes into account if one owns their home, has a mortgage or rents. When not accounting for housing status, the supplemental poverty threshold for a family of 4 is $24,343. The 2010 official poverty rate is 15.1% whereas the alternative, supplemental measure gives a poverty rate of 16%, or 2.5 million more people. In 2009, the official poverty rate was 14.3% and he supplemental poverty rate was 15.3%. By any measure, America has become more poor. Now, where all of the confusion came about in the press are the definitions of low income. The official poverty report defines low income as double the poverty threshold. The Associated Press came out blazing with the headline 1 in 2 Americans are poor or low income. That starling statistic threw other Journalists who bother to check their numbers into a tizzy. In turn they issued their own articles, poverty figures questioned, it's really 1 in 3 Americans are poor or low income. Both press reports are right and wrong, but few seem to realize why that's so. Here's what happened. The Associated Press is quoting the supplemental poverty measure. The Journalists who went and fact checked were quoted the official poverty measures. To make matters just a little more confusing, the supplemental updated the official poverty threshold percentages to include people living in households who are not counted by the official poverty methods. The below table illustrates the difference. While the supplemental goes into different income levels depending upon all sorts of conditions, very roughly, for a family of four, the difference between the two poverty thresholds is $2230. So, look at the definition of low income, or twice the poverty threshold, the difference between the two rates should be about $4460. The official low income level would become $44,226, while the supplemental low income level would be $48,686. This is for your classic two adult, two kids family. Now, look at these low income levels and compare that with the median wage, which is not the same as income. 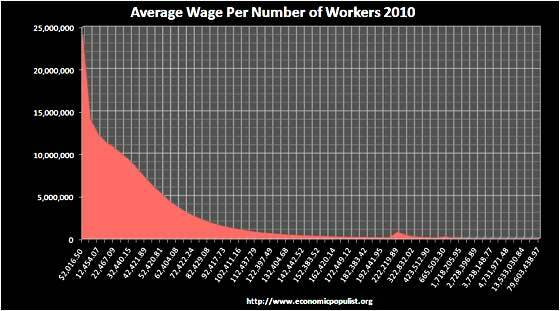 The 2010 wage levels tell us over 50% of working people are making less than $27,454 a year. Are you surprised that most of America is not counted as low income? Me too. The two graphs above show the number of people, or workers in each yearly wage bracket. What you see is the working poor. The largest number of workers, over 16% don't even make $5k a year. 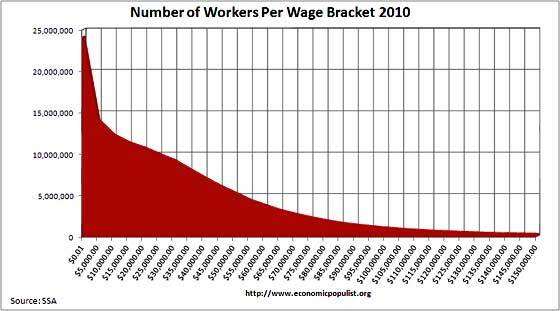 Over 25% of all wage earnings are not even pulling $10k a year. Most people are simply not making a living wage and this is how one can get half of America is poor or low income. Even more telling is the 2010 median income, which runs higher than just wages and salaries. For everyone, including the rich, singles with no kids, families, everyone, the median income for 2010 was $49,445. Frankly, I think the supplemental poverty measure is more on the money. or lack thereof it. The fact median income and income twice the poverty threshold are so close, tells us half of America is truly in the poor house. Your conclusions and analysis are flawed. Indeed, you need much more before you can convince anyone who takes the time to consider what you've concluded. Since I know how my life has gone, then "I" will be me. As a teenager, I entered the world of "wage earner". I worked summer construction jobs for a good hourly wage, but only for a few months. This work pattern continued through college years, too. Thus, I was a "low income" or "poor" person for almost 10 years. Now, some 35+ years later, I have no debt, have a net worth of about $600,000; will declare wages of about $20 k for 2011, so I am considered "poor" to "low income" today. I know many people in similar circumstances. We are not destitute nor poor, well, maybe a little "cash poor", but that's a different issue. This is not to say there aren't many people hurting, but you're conclusions are incorrect and misleading. I have seen a lot of misery in my lifetime, and I don't hesitate AS A PRIVATE CITIZEN to help those in need. There are many people who earn wages who are not poor, indeed, they might be considered wealthy. There, too, are those "gaming the system" to get "gummint" assistance, and they are "poor in spirit". And, people, just as I did, move in and out of these statistical hodge-podge's constantly. Hopefully, your remarks are made from not fully understanding real life issues combined with this data versus an attempt to misinform. I do commend you for at least using some facts vs. just spewing forth what you "feel" or "think". Sorry but your last comment says it all, use facts instead of think of feel. One person with retirement funds refusing to access them to the point of living below the poverty threshold is not a statistic. The data from this overview is direct from the Census. There are a host of income sources taken into consideration by the poverty measures. Both the official and alternative take into account pension payments, social security, retirement fund outtakes, interest on savings, dividends. In order to live, even in retirement, someone is taking money out somewhere from savings to do that and it is captured, measured. More I think denial acts in strange ways, and the statistics are what they are, the Census are not manipulating anything, whatever measure you look at America has become poor. Well my ex has an uncle in a similar situation. Dropped out of college, lives with his parents. They pay for all of his bills, transportation, entertainment. He doesn't get any "gummint" assistance, just mom and dad. I'm sure he'd say he does just fine on $10k or so a year. Maybe you have a point. For those people who want a family and well, everything this country has been providing to previous generations, its a complete letdown. Well, yes, stats describe populations, not individuals. I once met someone whose aunt had won a huge lottery amount and made him (person I met) and his family very happy and well-cared for. Some of them worked and still do work. Some don't. All the kids were supported through college. I guess this proves something ???? No .... but they are all included in the statistics somewhere ... so that disproves the statistics ???? It's true that some people constantly move in and out of statistical strata, but many people do not. If Robert Oak limited blogs to income statistics, there would still be meaning in income averages, especially since there's more to statistical analysis and reporting than overall averages. Also, about construction jobs working through college -- those were generally in residential construction, as I recall ... and so ... hmmmm ... something about anecdotal evidence again ???? I mean what was true in the 1960s is, of course, true and applicable today ???? Of course, it is true that some people are in the enviable situation of "declaring wages" according to the most desirable tax outcome ... and there's a point here, not to be missed ... wages do not equal taxable income (which does not equal total income which may or may not indicate wealth or poverty). Howard Hughes never paid income taxes because he never made any money -- everything he did, including eating, was part of his duties serving his various corporations. As another example, when Nelson Rockefeller was interviewed by the Senate before being named VP for President Ford, when the committee noted that he had not provided income tax returns, he explained that he had never had any income! So, of course, while income is more measurable in the U.S. system and therefore gets a lot of attention, wealth is much more difficult to measure and report on. That doesn't mean that income or net worth statistics are meaningless. Devil is in the details, but Robert Oak, IMO, is very good at getting into those details to see what's really going on.